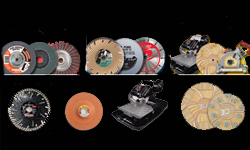 With the demand for consistently high quality, cost effective abrasives on the rise, the Pearlman family recognized that the industry was ready for a customer driven abrasive distributor. Using this philosophy, Pearl has expanded from a small family enterprise into an international corporation selling coated and bonded abrasives, diamond superabrasives and equipment throughout North, Central and South America. In 1968, The Pearl Abrasive Company was founded as a wholly owned subsidiary of the family run Pearlman Corporation.